Reference names and phone numbers available upon request. In the Last Year Gabriel Media has Added up to 30+ New Annual Contracts in 62 Markets Across the Country including $1,000,000+ in New Direct, Annual Business in Birmingham, AL, Augusta, GA and Killeen-Temple, TX! But don't just take our word for It, ask these great radio operators how we did it – the sales friendly way! We work in Partnership with your media company. Gabriel Media is a full-service sales performance company specializing in innovative ideas that generate revenue for the Radio and TV industries. We don't tell you how to make more sales, we come into the market and do it with your team! 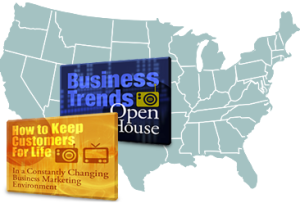 Gabriel Media's Open House Programs Really Work! Gabriel Media is a sales performance company that conducts Open Houses for the sales departments of radio and television stations. We sell hundreds of thousands of dollars in new business in your market place... find out more on our YouTube Channel.